Note: Make sure the Multi-Projection setting is on (Menu > Extended > Multi-Projection > On) before you adjust the projector's brightness level. Turn on all the projectors and display the same image. Select the Settings menu and press Enter ( ). Select Brightness Settings and press Enter ( ). 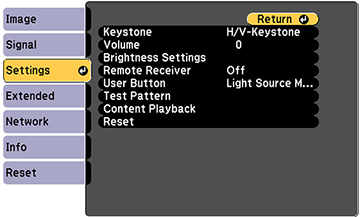 If you select Custom, select the Brightness Level setting from the Brightness Settings screen and use the left and right arrow buttons on the remote control to adjust the brightness level. Press Esc to return to the previous screen.